Poor Rosie. Yesterday we went to a barbecue at Sho-chan's company and Rosie played soccer with some of the kids there. She looked like she was really having a good time running around like wild and chasing the ball. But, when she finally got tired of playing and came back to where Sho-chan and I were sitting she was walking kind of strangely. She looked really exhausted and like she was having trouble walking. I got really worried when I saw that, thinking that maybe somehow she had broken a bone or something, and we left the BBQ right away to take her to the animal hospital. When we got to the hospital and took a good look at the bottom of her feet, we saw that all four of her paws were badly cut, and some of her nails were broken. Probably from running around on the concrete, but I never would have thought that could happen. Her paws looked so painful and I felt so sorry for her. When we asked the vet what to do, she said that in most cases even if you bandage the paw, the dog will just be bothered by it and pull the bandage off by itself, just making things worse, so we just got some anti--biotics and took her home. Today she's still walking really painfully and it seems like getting to the park to pee under her own steam is going to be impossible, so Sho-chan and I are taking turns carrying her. We thought about using a wheelbarrow or something, but when we tried to put her in it, she totally freaked out and now she won't even go near it. I hope our poor daughter will recover quickly. update: She's doing a little better today. Rosi poor. Yesterday her company's positive, you want to barbecue, low. The kids and playing with the soccer. Mirthfully very fired up, chased the ball around. 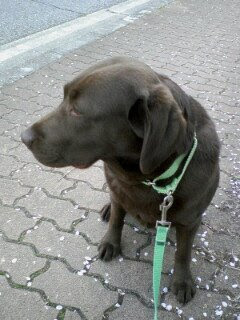 Play tired, and I go back under her positive when it is OKASHIKATTA walking strangely, it was extremely difficult HEROHERO walk. I was very anxious to see the "chances are that her bones were broken," and worried about the barbecue to leave early and went with animal hospital. Animal Hospital of feet, it is often common in the four ball feet with a badly cut meat Resona tear, and the nail was also some time. Perhaps full concrete I ran because it was, I think it is absolutely not. I'm sorry I really spicy. But a veterinarian's advice to him, gauze wrapped around it on one's own is taking her six-worse in many cases it is said that, he went back to get antibiotics only. Today it is still very painful to walk, and the park on one's own is not likely to go of the positive and I take turns on her lap to take. In a wheelbarrow accompaniment of a lift and thought I'd go, but once I really hate it wanted to cart approached me. The poor can heal our daughter is quick to pray. update: this morning a little BETTER.